In the public sector, the parallel legal and political assaults on “union security” agreements and automatic deduction of dues or fees from government employee paychecks has unfolded in those two states, neighboring Wisconsin, and every state with recently created bargaining units for home-based direct care providers. With adverse ramifications for 700,000 similarly situated union-represented workers in other states, the Supreme Court ruled in June’s Harris v. Quinn that publicly funded home health care aides in Illinois were only “quasi-public employees.” According to the decision, such workers are no longer subject to the local public-sector labor law that non-members pay their “fair share” of the cost of union representation and services, which unions must provide to everyone in their bargaining units. When Service Employees organizer Rand Wilson and I wrote about this emerging trend two years ago in an essay for Monthly Review Press entitled “Union Survival Strategies in Open Shop America,” we noted that there were already more than 1.5 million Americans covered by union contracts who had declined to become members. Based on developments then under way in the Midwest, we predicted that the guaranteed income stream that many U.S. labor organizations had long enjoyed—and used to pay for their large complement of lawyers, lobbyists, full-time negotiators, and field staff—would soon be interrupted. For example, in Wisconsin, where public employees had just been battered by contract concessions before being stripped of meaningful collective bargaining rights, most of their unions had not functioned as voluntary membership organizations for three decades or more. We expressed the concern that a new, more intimidating workplace environment might combine with rank-and-file resentment over wage and benefit givebacks to send dues receipts plummeting—if unions did not move quickly to strengthen their shop-floor presence. In Indiana, a similar Republican revocation of “dues check off” and more limited bargaining rights caused stateworker union membership to drop from 16,400 to fewer than 1,500 from 2005 to 2011. Two years later, after Michigan legislators excluded home care workers from their state’s definition of public employees and stripped them of bargaining rights granted by a previous Democratic governor, membership in the Service Employees International Union (SEIU) declined by 80 percent—from 55,000 members to fewer than 11,000 in a single year. Founded in 1932 as a pioneering AFSCME affiliate, Madison-based Local 1 went from 1,000 to 122 members. To keep the union alive, “99 percent of what the staff does is organize,” explained AFSCME council director Marty Bell. “Without the ability to bargain, Bell’s union mostly represents members and engages in collective action,” according to The Times. Local affiliates of the American Federation of Teachers (AFT) have been similarly decimated—in part because of official resistance to lowering dues—while their counterparts in the National Education Association (NEA) have done better maintaining Wisconsin membership. Now comes Michigan, where the most recently enacted state “right-to-work” law is going into effect for 112,000 public school teachers, who represent one out of every six union members in the state. During all of August, they’ve had a chance to “opt out” of paying for their union representation. In a previous “opt out” period last year, only 1,500 did, amounting to about 1 percent. But this summer, teachers have been bombarded with anti-union mailers and newspaper ads—the latter purchased by Americans for Prosperity, a Koch Brothers creation. These have urged them to withhold annual payments of up to $822 to the Michigan Education Association and its parent organization, the NEA. Other major unions in Michigan, including the United Auto Workers (UAW), have multi-year contracts that are in effect until 2015 or later. When those expire, more private sector union members will have the same choice as teachers this summer. As the Associated Press reported August 25, “a significant number of drop outs would deliver a financial blow to labor in a state where it has historically been dominant”—or, at least, far more influential in the past than today. When a cash-strapped UAW hiked its dues earlier this year, opponents of that measure warned that higher dues might encourage more of the union’s 50,000 Michigan-based autoworkers to drop out next year. Of particular concern is the simmering resentment of more recently hired UAW dues-payers, who are demanding changes in the Big Three’s two-tier wage structure that currently leaves them far below the hourly pay of higher seniority workers. If that issue is not satisfactorily resolved in the next round of auto industry bargaining, the Koch-backed Americans for Prosperity may even gain traction in a few auto plants. Newer additions to the nation’s unionized homecare workforce—like the statewide unit of 27,000 personal care attendants in Minnesota who won union recognition August 26—will need continuous internal organizing to boost their membership levels hereafter. In that newly recruited group, only one-fifth of the workers eligible to vote actually cast a ballot for or against SEIU, which won by a margin of 60 to 40 percent. In an open-shop environment, under a less friendly governor, the other 21,000 could easily go the way of SEIU’s now-lost dues-paying majority in Michigan home care. Ironically, some of the best examples of what McAlevey calls the “high participation model” of union building can be found in southern “right-to-work” states. As Wilson and I reported in our “open shop” organizing chapter in Wisconsin Uprising: Labor Fights Back (Monthly Review Press, 2010), “non-majority” unions have been constructed by public-sector members of the Communications Workers of America in Tennessee, Texas, and Mississippi and the United Electrical Workers in North Carolina—all in the absence of formal collective bargaining and any mandatory payment of dues or fees. These member-driven labor organizations have devised more reasonable dues structures, ways of collecting dues voluntarily, and, most important of all, a workplace and community presence not defined by employer recognition or statute. Their survival and effectiveness depends on worker activity—the kind of member mobilization around job-related and legislative/political issues that labor needs, in many other states, to remain “organized” without the legal props of the past. This post originally appeared on Classism Exposed. 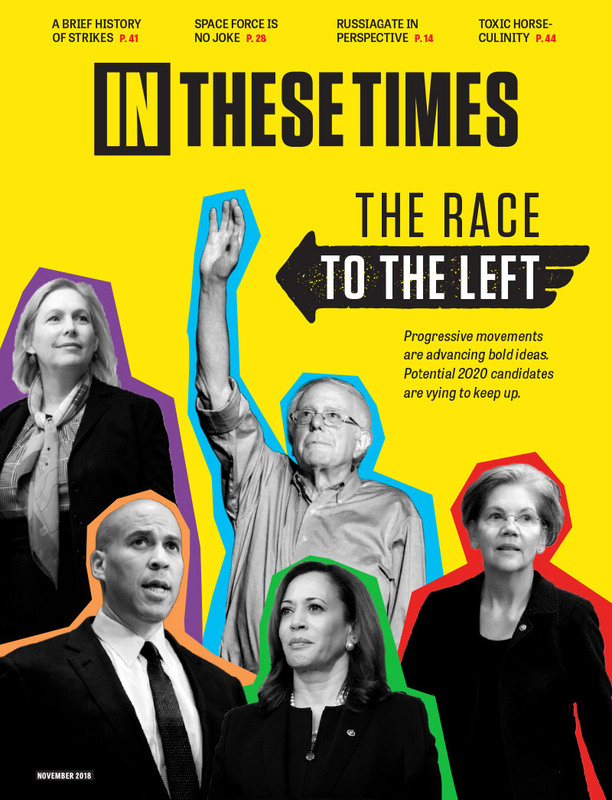 AFSCME, UAW and CWA are website sponsors of In These Times. Sponsors play no role in editorial content. Payroll deduction, convenient as it is, tends to make union leaders at all levels a bit lazy. As long as the dues money is rolling in, you don't have to worry about the fact that the majority of your members are culturally and emotionally divorced from their union. They pay dues but they don't really know what a union is or how it works. It might as well be an insurance company. When the union is no longer able to bargain for you and represent you, it seems to make sense to save your money and not buy a useless product (especially since management has reduced your take-home pay). Former union members do not understand the political investment involved in paying union dues because they never saw the union as a political organization, nor did they understand themselves to have any role in how the union operates.